The enterprising Doctor will bridge two famous science fiction universes this May. Crossovers are usually bound to the nightmarish, often illegible domain of "fan fic," a terrifying afterlife of sorts where the visage of many a favorite hero sometimes travels, only to be subjected to awkward, unnatural romances, dialog that would offend an Xbox Live user, and situations more contrived than the plot of The Phantom Menace. Still, news of their creation can be exciting when handled officially and properly, and the latest creation of comic publisher IDW is already the former and seeks to be the latter. 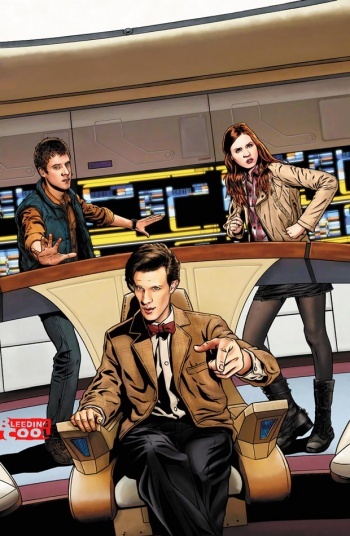 This May, IDW will be releasing an officially sanctioned Who/Next Generation crossover series starring The 11th Doctor (the bowtie wearing Matt Smith one), his companion Amy, and her companion Rory skittering about the greater universe with Captain Picard, Worf, Data, Geordie, Troi, and Riker. This crossover series will be the first of its nature for the good Doctor, while Star Trek already dabbled in both the X-Men and Legion of Superheroes universes before now. We don't yet know exactly whom the baddies will be (I'm personally hoping for a Borg/Dalek alliance, at risk of being a mite too obvious) but we do have the cover for the first issue, shown above. Hopefully more details will emerge at the Gallifrey One convention on February 17th, when IDW is expected to announce the comic official-like.